Last week, I had the chance to visit briefly with my son again, while they were on a tour stop at Ferris State University in Big Rapids, MI. And while I love shooting Chris at work, along with Joe Nichols and his band (The “We Ain’t Got No Damn Band Randys”), I decided not to do much of that this trip. After all, I’ve already shot about ten or eleven of Joe’s shows over the last couple years, with pretty much unlimited access. But like any photog worth his salt, I couldn’t just sit through the warm-up act with my camera gear sitting idly by. 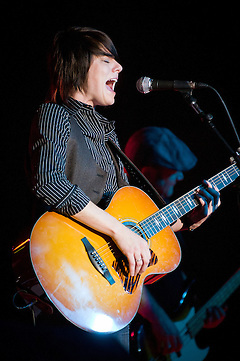 The opener was a singer-songwriter from Atlanta named Sonia Leigh. Honestly, I had never heard of her, so I wasn’t sure what to expect. Let’s just say, I think you’ll be hearing her name in music circles quite a bit more in the future. She’s a young, scrappy, tomboy-ish little thing with a voice bigger than her diminutive frame would suggest. As I started shooting her set, I tried to dissect her musical influences, and more specifically, which other singers she reminded me of. I detected (in no particular order) Melissa Etheridge, a little Indigo Girls, a touch of Bonnie Raitt, a splash of Janis Joplin, maybe some Tanya Tucker, a little Sheryl Crow, some Brandi Carlile, and much more. Her songs covered the usually country fare – livin’, lovin’, drinkin’, fast cars, and broken hearts. 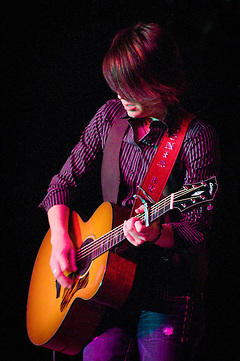 The basic band (guitar, bass, drums) behind her smoky voice and acoustic guitar, was a natural fit for her no-frills music. She won over the crowd pretty early on, and seemed to keep them entertained for the duration of the set. 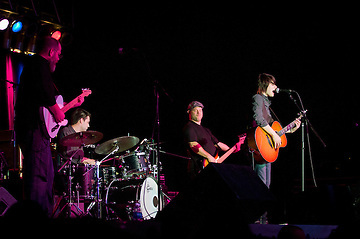 I moved around the middle of the arena floor shooting Sonia and the band. While I could have pushed my way through the crowd to the front of the stage, I didn’t really feel I could have gotten any better images there. It’s always interesting and exciting shooting an act I have never heard – I think it causes me to pay more attention to the performers to try and predict what will happen next. I felt I walked away from venue with some pretty solid shots, and I learned about a new, up-and-coming artist in the process. The full photo gallery of images from the show can be seen at my website. Pingback: Out With the Old… – What Was I Thinking?